Castleton is well known for its deposits of Blue John, a flourspar which contains various shades of blue and purple. 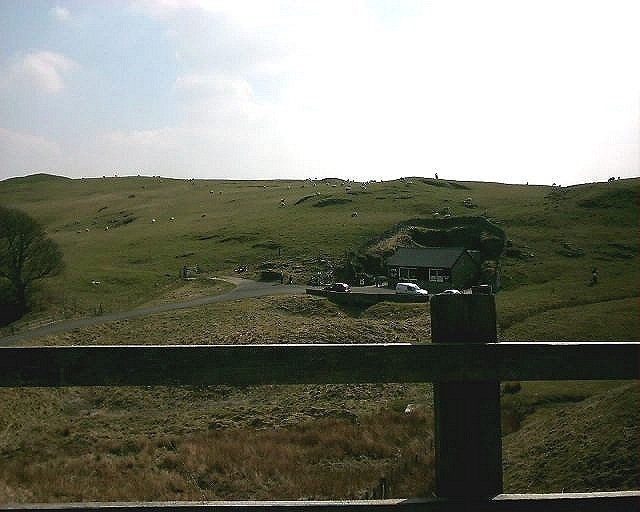 The Blue John Mine is open to the public and is accessible from Rushup Edge, - turn left at the end, or - if you are approaching from the East, you will turn right at the top of Winnats Pass, and then turn right at the first sharp bend (actually this right turn is more like straight ahead - but you are turning off the main road and dropping down onto the old Mam Tor road - which is now closed due to subsidence. In the left of the picture, there is a tree, just left of the tree is a hole in the ground about 20-30 ft deep and about 30 feet in diameter. It looks like at some point the slag from the mine was dumped into this hole in small quantites, and as a boy - I found many chunks of Blue John down there. Unfortunately these days the area is fenced off, and your are probably not allowed down there anymore. The mine itself extends deep into the hillside, it contains samples for viewing and also the workings the miners used hundreds of years ago. Eventually, the miners dug so deep they entered the large caverns known as Treak Cliff cavern - now accessible on the other side of the hill.